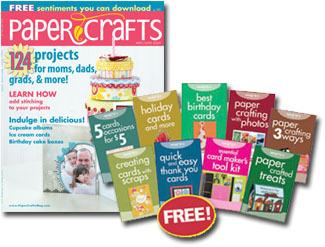 Subscribe to Paper Crafts magazine at 40% off the newsstand price, plus get 9 FREE gifts! Paper Crafts magazine will inspire you with hundreds of fresh ideas for gifts, handmade cards, gift bags, tags and much more! Each issue features a variety of the hottest new styles and techniques for making amazing do-it-yourself projects. Is this how I subscribe to your blog? I love Paper Crafts and Stamp It. I just found your website, and I am coming back to read up! I’m also looking to subscribe to your blog. I love the info on this website! It’s creative, inspiring and a good read to boot! Thank you! The prize package is “fan-tab-u-las”! Thank you for putting such a great package together. It has obviously inspired so many of us! Enjoyed your blog and would like to sign. Alot of cool information and creativity to be had. So, I went to your website and looked in several of the pages, including the “subscribe” link, and find NO reference to this publication. Just thought that you should know! I just found your blog when reading your May/June magazine. I’m addicted.Thank you so much for all of your hard work. It’s awesom. I love all these cute designs you can make with stamping and card stock. Creations Downloads. I paid cash for my magazine at Barnes and Noble Bookseller here in Omaha, and when I got to the end of the list , It wanted my credit card number!!! I have been a Paper Crafts subscriber for a few years but I am not very computer savvy. I guess having a husband for a computer guy DOES NOT help, he does it all. But I also don’t have a job where I sit in front of a computer…It is frustrating to get a magazine and not be able to print it, or the patterns, that is why I personally HATE the new format, Because I could just take the magazine to KINKOS. But if they are going to have it at the booksellers or newstands , I think they really should have the patterns available for printing. I know they might be waiting because of dishonest people taking advantage of it. This is the problem with the internet. That is why I only go to a couple of sites . Thank you for hearing me out. I appreciate your time. I did NOT know they even had a BLOG on here. Love your magasine and now the site! Thanks gals. Getting my Paper Crafts magazine in the mail is like a little chance to run away while summer flies around me with kids, ice cream trucks and baseball games! Thanks for such a great magazine! Beautiful blog! Love the cards…I’m inspired! Thanks so much! A friend gave me a subscription for Christmas and I also send a card in to subscribe 2 months and have not received one issue yet. Could someone please explain why. I love Papercrafts magazine and have been for many years even though I don’t subscribe to it anymore and buy it when I can due to being a Single mom and my budget. I still love the layouts and instructions and all that good stuff including the blogs on the internet and I became a fan on FB too! I love stamping and making cards and I do it for ministry now too…why waste a talent and use it for good besides for family and friends! I am new the God to Gals but I love the blog!!!!! You are hilarious… and now the Moxie girls..lol…but you are all so wonderful and humorous and creative team…I am proud to know you and the magazine!!!! !